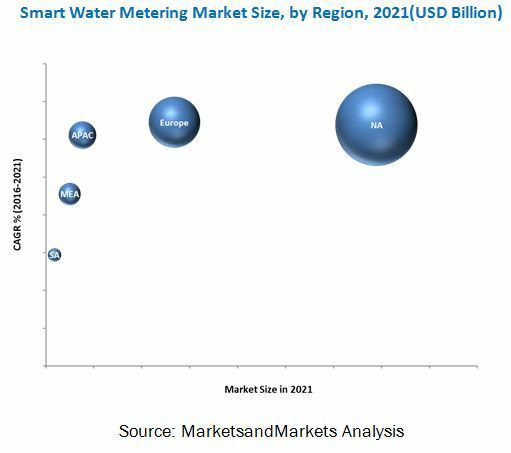 [200 Pages Report] The global smart water metering market was valued at USD 3.73 Billion in 2015, and is expected to grow at a CAGR of 7.23% from 2016 to 2021. Factors such as increasing focus towards reducing non-revenue water, retrofitting of aging water infrastructure, and the need for accurate billing are driving the market worldwide. For company profiles in the report, 2014 has been used as the base year. Wherever recent (2015) data was available, it has been included. This research study involves extensive usage of secondary sources, directories, and databases (such as Hoovers, Bloomberg, Businessweek, and Factiva) to identify and collect information useful for this technical, market-oriented, and commercial study of smart water metering. The points mentioned below explain the research methodology applied in making this report. After arriving at the overall market size, the total market has been split into several segments and subsegments. The figure below shows the breakdown of the primaries on the basis of company type, designation, and region, conducted during the research study. The smart water metering market starts with the manufacturing of basic components including meters and related accessories. 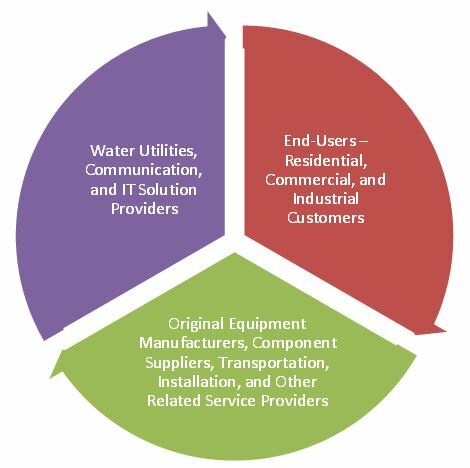 The final stage covers water utilities, solution providers, and end-users. The smart water metering market is projected to grow at a CAGR of 7.23% from 2016 to 2021 to reach USD 5.51 Billion by 2021. Increasing focus towards reducing non-revenue water, retrofitting of aging water infrastructure, and the need for accurate billing are the major factors driving the market. The report segments the this market on the basis of application into water utilities and industries. Based on component, the smart water metering market has been categorized into meters & accessories, communication, and IT solution. The market has also been categorized on the basis of type as AMR and AMI. Meters & accessories, which account for the maximum cost among all the components, held the largest market size, in terms of value, in 2015, followed by the IT solution and communication segments, respectively. In this report, the smart water metering market has been analyzed with respect to five regions, namely, Asia-Pacific, North America, Europe, South America, and the Middle East & Africa. North America is currently the largest market for smart water metering, followed by Europe and Asia-Pacific. Factors such as repair & upgradation of aging water infrastructure and focus on reducing water leakage, preventing water theft, minimizing inaccurate metering, and managing growing water scarcity would positively impact the smart water metering market globally. The figure given below shows the regional scenario of the smart water metering solutions from 2016 to 2021. Some of the leading players in the this market include Itron Inc. (U.S.), Elster Group GmbH (Germany), Sensus (U.S.), Landis+Gyr (Switzerland), and Kamstrup A/S (Denmark), among others. Contracts and agreements was the most common strategy adopted by the top players in the market, constituting more than one-third of the total development share. It was followed by expansions, new product launches, and mergers & acquisitions respectively.